This November, Prophecy Productions invites fans to attend the inaugural Prophecy Fest USA, presented by Stardust NYC and Invisible Oranges. 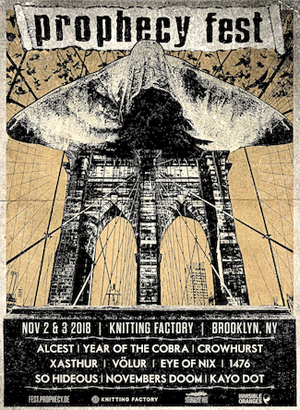 Taking place in Brooklyn, NY at Knitting Factory on November 2nd & 3rd, the Fest will showcase the label’s recent North American signings, as well as special guests and the triumphant return of French blackgaze legends, ALCEST, playing Kodama in its entirety - possibly for the last time. Today, the label has revealed the complete lineup and set times for the festival, as found below. Purchase tickets to Prophecy Fest USA HERE. Additionally, Prophecy Productions has created a special digital compilation, Dusk In America 2018, that showcases the label’s North American based acts. It's available to stream for free via Bandcamp and/or to purchase at your own price. Check it out now at https://prophecy-de.bandcamp.com/album/dusk-in-america.